Bringing children security through the Revelation of Jesus. 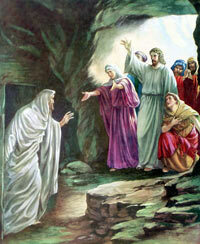 Additional Bible Study Scriptures for "Jesus Raises Lazarus "
For parents or teachers who would like to study this topic further, or look up Bible verses with older children, here is a list of Bible verse references that were either quoted directly, alluded to, used in planning this Bible lesson, or can be used for further study. Children's Bible Lesson Place is a Christian website devoted to helping children come to Jesus.